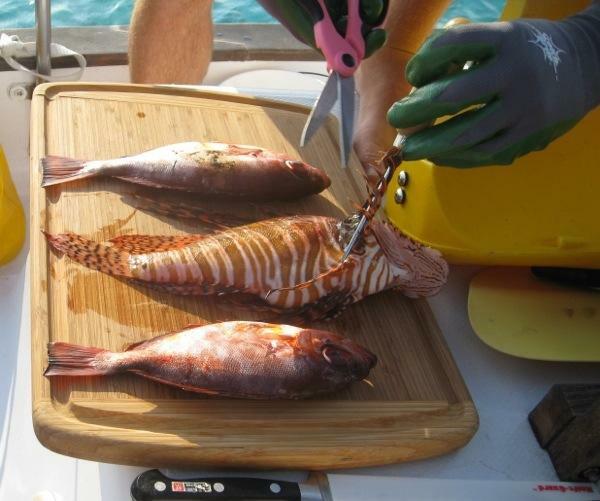 Inquiring Minds Want to Know, How do you eat a poisonous Lionfish!? Lionfish are beautiful creatures; red and white striped fish with fanned fins that resemble a lion’s mane. However they must be admired from a distance because they are armed with toxic spines down their back. The toxins on the spines produce pain and swelling to afflicted areas. Lionfish are native to the Indian and Pacific oceans. Lionfish have been introduced to Eastern waters; in the Bahamas as well as much of the Carribean, they are an invasive species. They have no predators and they are eating native fish at remarkable speed. Humans, at this time, are the only predator able to keep the lionfish at bay; fishermen are encouraged to spear the fish at any size. The fish itself is not poisonous. In fact, restaurants have begun to add lionfish to their menus. The key to dining on this plentiful fish is knowing how to safely filet it. It is a delicate, white fish. Brian received a lesson from our friends aboard sv/Por Dos and was finally able to use his newly acquired skills while anchored at Big Majors Spot. While spear fishing with Bruce, Brian nailed a sizable lionfish. He was extremely cautious to not touch the spines as he scraped the fish with a knife from his spear into our fish bucket. 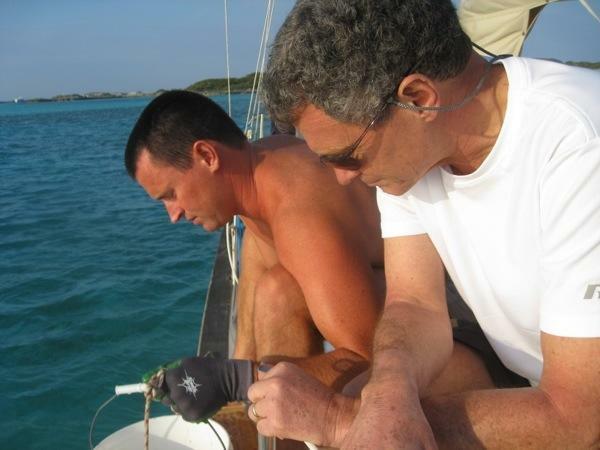 Once back at the boat, he demonstrated to Bruce how to filet the fish while encouraging Kathy by reassuring her that she would not die instantly if she tasted the lionfish. First step: remove the spines without touching them by clipping them with scissors. Just to be extra cautious, the fins were snipped as well. Then the fish can be treated as any other fish. It does not have scales and can be cleaned and cut into a filet. 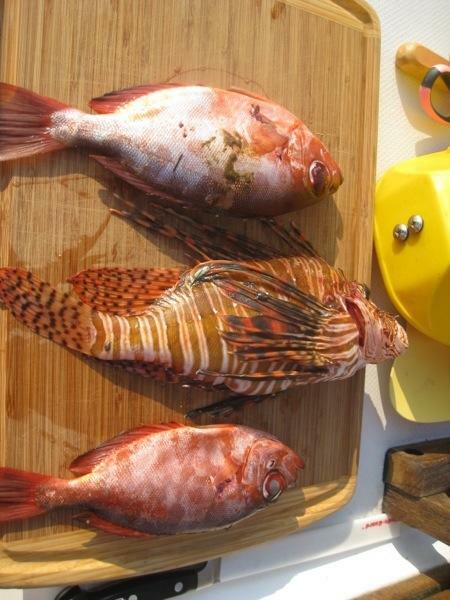 We broiled this lionfish and picked the meat to use in fish tacos. It went nicely with the glass eyed snappers that Bruce and Brian shot. Tasty! This entry was posted in Uncategorized and tagged lionfish by stephanie. Bookmark the permalink. Thanks for the information. I hope that we catch lots more fish next trip.